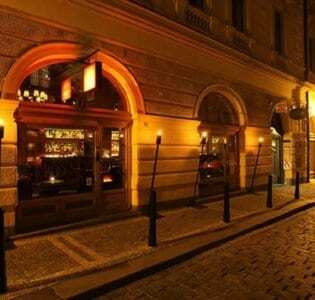 This stylish seafood and champagne bar is somewhat hidden away behind the Ungelt in Prague’s Old Town. But despite its proximity to some of the city’s best-known sites, not to mention the tourist-magnet that is the Old Town Square, this is an elegant, sophisticated spot (dubious disco ball aside). The interior has a decidedly Parisian feel with chandeliers, black and white tiling and a central oyster bar, and lots of large mirrors making the room feel airy and light. Their seafood is impeccably fresh, the titular bivalves served on beds of crushed ice, and they do a splendid lobster roll, packed full of lovely lobster meat, one of the best examples you’ll encounter outside the US. House bread is excellent and there’s a real attention to detail evident in everything they serve here. There’s an excellent range of wines, cavas and champagnes available by the bottle and by the glass (and by the magnum if you’re celebrating), the service is friendly and knowledgeable and there’s a scattering of outdoor tables which are highly prized on warm evenings despite the throb emanating from Chapeau Rouge across the street. The prices are some of the steepest in the city but few other places in Prague offer seafood of this quality so we reckon it’s a fair trade.